Extra large dog breeds are full of surprises, mostly in a good way! One of the first things you need to know is that you don't have to live on a ranch, walk 10 miles a day, or be 6' 5" and 300lbs to own one.... and in spite of their size they're often gentle, low-energy and very mellow! But of course, not every home (or family) is the right place for an extra large or giant dog of course, and their awesome size means that they have some very unique needs. If you choose to add a large or giant dog breed to your home, it's important to know how to take care of him, and make sure he grows up healthy and strong. 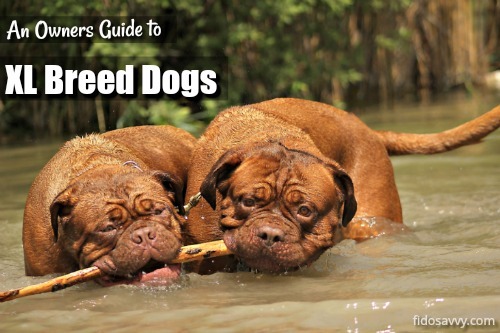 You'll find everything you need to do just that right here on this page, including tips and advice on feeding big dogs, exercise requirements, potential health problems and more. Which breeds are considered to be extra large? Interestingly, there's no one set 'standard' or 'system' that defines what are considered extra large breed dogs, and there's no specific documented height/weight minimum. It's also a bit subjective because if you've always owned dogs on the smaller end of the spectrum, a well-built Labrador Retriever will probably seem pretty big! But, obviously any breed considered to be 'giant' has to be at the very top end of the scale. As a rule of thumb, a dog who is going to weigh over 100lbs when fully grown is usually considered to be an extra large dog. Bear in mind though that weight isn't the only factor either, height has to be taken into account too. Some very big dogs aren't terribly heavy due to their bone structure, but they are very tall. When I'm talking about extra large breed dogs on this page, I'm going to include those breeds who consistently produce males that weigh between 95lbs and 200lbs, or are over 24" tall (at the shoulders). These BIG dogs often look strong, bold and very robust - but in reality this isn't always the case. Giant dog breeds are actually less robust than their more moderately sized 'cousins' and are more fragile than they look (both physically and emotionally). The enormous rate of growth that extra large breed puppies experience, puts them at risk for bone and joint problems, such as hip dysplasia, on a scale not seen in smaller breeds. They are also at risk for Bloat (also known as Torsion), thyroid and other hormone issues, heart problems, cancers and more. Extra large breed dogs also tend to have a shorter life span. Of course, small and tiny breeds have their own set of unique health concerns, but they are often quite different. Because these canine giants have such a huge physical presence, inexperienced owners sometimes think that they need to be handled more sternly and in a more 'physical' way than the smaller breeds so. This is totally incorrect. Obviously, if you barely weigh in at 100lbs and are 5' tall, taking a Great Dane (who could weigh anywhere up to 170lbs) for a walk may be a challenge, but many of these extra large breed dogs are truly 'Gentle Giants'. Loud voices, harsh reprimands and physical corrections are only going to scare them and cause them emotional distress. In some of the larger 'guardian' breeds, such as Rottweilers, Cane Corso or South African Boerboels, this sort of attitude can make them resentful, obstinate and defiant - not a good combination. Although there is no such thing as a 'free puppy' (because of many needs these little creatures have), the cost of raising a Newfoundland puppy is going to be considerably more than the cost of raising a Yorkie.... it's a no-brainer! 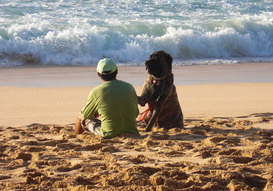 Check out the REAL $$ cost of dog ownership here! I wouldn't recommend extra large breeds as FIRST TIME dogs for families with small/young children unless the adults are totally aware of the need for supervision of both four-legged and two-legged 'children' at all times. The main reason for this observation is simply because of the a big puppys' size, not their temperament. As I mentioned earlier, large and x-large breeds are very sensitive, loving and gentle in general and are not aggressive or deliberately hurtful. But big 'uns can be clumsy, and could easily knock down or hurt a small child while playing with them or greeting them, if they're not being supervised or trained properly. They can also be a great 'fit' for families with older/pre-teen/teen children where the danger of a small human getting accidentally hurt isn't an issue and there is plenty of opportunity for play/exercise and activities with the whole family. The American Kennel Club Breed Index has lots of information on the majority of the big dog breeds in the above list, including the breed history, breed standard and links to breeders with available litters. 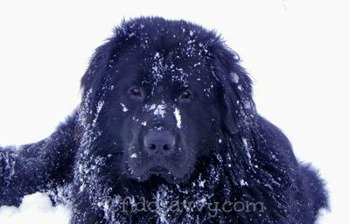 What Do Extra Large Breeds Need? Big puppies need bigger 'stuff'. Of course there are the obvious 'puppy supply basics' like crates, beds, toys, collars, leashes and so on, but you also need to take into account that your giant breed puppy will eat WAY more than a teacup puppy will. Not to mention, you'll need the 'large size' of just about everything from treats to medications (think flea and tick preventative, heartworm medication etc.) and more. Trust me, this adds up! But it doesn't end there. Extra large breed dogs also need more room. A Great Dane will take up considerably more space on your living room floor (and the ENTIRE sofa), in your car and in your yard. The good thing is that these big dogs aren't generally more active than small breeds, in fact a terrier will just about always run rings around a Mastiff! As puppies, all breeds are active and need to run and play, but as adults many extra large to giant breeds tend towards the 'couch potato' mentality. 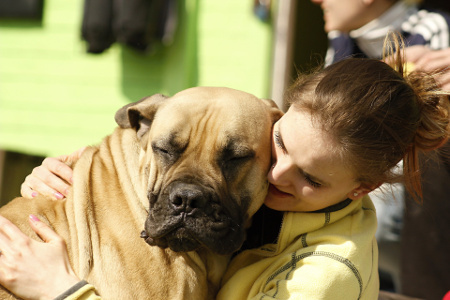 Large breed puppies need lots of love and are almost always big babies! They can be very clumsy and seem to have little-to-no control over their limbs, tails or any other part of their bodies. This isn't their fault.... extra large and giant breed puppies grow at a phenomenal rate and they literally seem to be bigger/taller every day. Their brains just don't seem to be able to keep up with their ever-changing bodies and they're constantly misjudging how tall/wide they are. Even as adults they seem to retain this total misunderstanding of their real size... my big dogs are still totally convinced that they can curl up in my lap. The fact that they weigh more than I do doesn't seem to occur to them... ever! Big dogs don't need harsh words, physical reprimands or a raised voice in order to respect or obey you. They're just like their smaller 'cousins' and respond much better to loving, patient and positive rewards-based training. In fact, getting 'tough' with a large or giant breed will usually simply make him stubborn... and it's pretty impossible to MAKE a big dog do anything with physical pressure. The bone and joint problems that so many of these giant breeds are prone to, can be caused by a genetic predisposition, an improper diet, environmental factors - or more commonly a combination of all of these things. Making sure that your giant breed puppy has his specific nutritional needs met, is very important role to his future growth and health. It will ensure his correct development as a pup, through adolescence to adulthood, and can go a long way towards preventing many of the health conditions that these extra large breed dogs are prone to. Extra large to giant breed puppies need to eat a premium food - holistic, all-natural or organic ingredients are preferable. Usually one that is specifically formulated for large or giant breed puppies has the correct balance of nutrients, but there are also some 'all life stages' foods, and even the occasional one that is designed for adult dogs, that fit the bill. Giant breed pups should NOT be fed a high-calorie diet, look for a more moderate range - somewhere around 350 - 380 calories per cup of food. This will help to prevent the overly rapid growth rate that's responsible for a lot of the bone/joint problems in extra large breed dogs. See some of the best options for pups on my Best Puppy Food Choices page, and for adult dogs on my 10 Best Dog Food Choices page. Extra large breed dogs who have reached maturity, need a different balance of ingredients, with higher levels of protein, fat and calories. 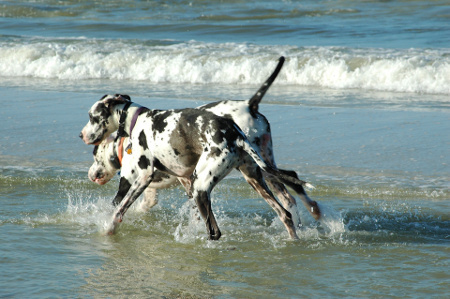 To learn more about this subject, I thoroughly recommend that you take a look at www.greatdanelady.com. This website has a HUGE amount of information and advice on feeding extra large and giant breed puppies. It's also not just the type of food that you feed that is important, you also have to be careful to feed the right amount of food. Overfeeding extra large breed dogs can also cause bone and joint problems. A nutritional imbalance can lead to too-rapid growth, or a puppy who is overweight - compounding the stress on the bones/joints. Particularly during the first 6 months, it's vital to control the calorie intake of your pup. Feed 3 times a day until around 3 months of age, when you can reduce it to twice daily. At 8 weeks old, 2 - 4 cups of premium food per day (depending on weight/breed - check individual bag for specifics) is about right, increasing slowly until 6 months of age when you should be feeding somewhere between 6 and 8 cups a day. Extra large breed dogs and puppies can be messy eaters! They tend to be a bit clumsy and can be 'drool-y' as well. It pays to invest in some non-spill, non-skid bowls if you want to keep your kitchen floor remotely clean and dry. 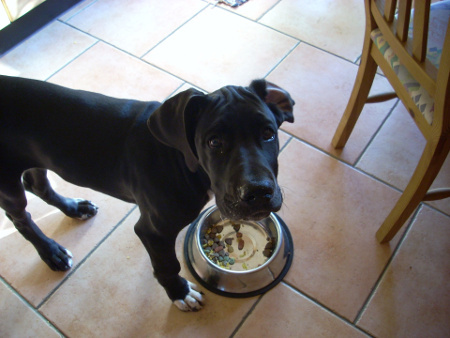 The activity level of your puppy or dog also plays a part in how much they need to eat. Obviously an active dog requires more calories than one who spends his days on the sofa, so take that into account when doing your calculations. This is particularly relevant for adolescent and adult dogs. Seasonal changes may also factor in. Like humans, dogs tend to eat less when the weather is hot, and during the winter months they need more food to burn to keep warm. Even if your dog spends 95% of his time indoors, he may still show seasonal changes in appetite. Extra large breed dogs grow very rapidly, but they take a long time to reach maturity as they actually develop quite slowly. 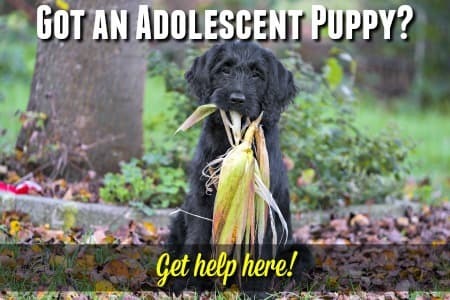 Sometimes owners can get a little impatient and want to 'put a little weight on' their pup, especially during the adolescent stage when puppies can look very 'gangly' and a bit out of proportion. But this is totally wrong. A giant breed dog may not be fully mature until 18 months, or even 2 years or older, and he needs to be allowed to develop at the pace nature intended if he is to grow up healthy and strong. You can learn about puppy growth rates on my Puppy Weight Estimates and Puppy Weight Chart pages. An overview of puppy developmental stages can be found on my Puppy Development page. If you have a large or giant breed puppy, it's important to take it easy with the exercise and rough-housing for at least the first 6 - 10 months. The rapid development that your puppy is experiencing means he is at risk of injuring himself if he is exercised too strenuously. In extra large breed dogs, hip dysplasia and other joint/bone problems can occur more easily than you might think. Jumping from any significant height - ie pick up bed, SUV, bed etc. Playing on slippery or slick surfaces such as tile, wet ground etc. Of course, your puppy still needs exercise in order to develop the strong muscles he needs to support his big heavy bones! A short walk several times a day, moderate games (eg fetch) outside and inside, and lots of socialization are needed. Enrolling him in a Puppy Obedience Class as soon as he's fully vaccinated is a great idea. Puppies are just like babies, and your little guy will play for a while and then need a nice long nap... then he'll wake up and start all over again. As adults, giant dog breeds are often on the lower end of the activity scale, and an adult Great Dane can live quite happily in an apartment, as long as he gets his daily walks. However, if you ARE an apartment-dweller there's something you need to think about before you make the decision to add one of these big dogs to your family. Housebreaking a giant breed puppy really needs to be done without the use of pee-pee pads, for obvious reasons, and that means you need to be able to get your pup outside quickly, multiple times a day (and night). Unless you live on the ground floor, this can be problematic, because carrying a 35lb - 50lb 'baby' outside (even if the elevators do work every single time) is a challenge most of us can't meet. Letting him walk by himself seems the obvious answer, but it's not that simple. A puppy is a very easily distracted creature, combine that with the urgent need to 'do his business' and very immature bladder/bowel control and the consequences are fairly obvious. PLUS (and this is a big one), most giant breed puppies will have trouble negotiating stairs, at least to begin with. He could hurt himself (or you) if he falls, jumps and so on. Large breed adult dogs are definitely sturdier than puppies and normal exercise and play is perfectly fine. Guard against extreme rough-housing or overly-energetic running, jumping as bones/joints can still get damaged. Also, big dogs tend to be clumsy, even as adults, and can hurt themselves (or others) when they get too excited or are moving too fast. Big dogs can be surprisingly fragile when it comes to their health, and they are at a higher risk of certain problems than medium-sized or smaller breeds. Orthopedic conditions (such as hip dysplasia and arthritis) tend to be more prevalent, or show an early-onset, in large and giant breeds, plus they are more susceptible to developing certain illnesses (both genetic and contagious). 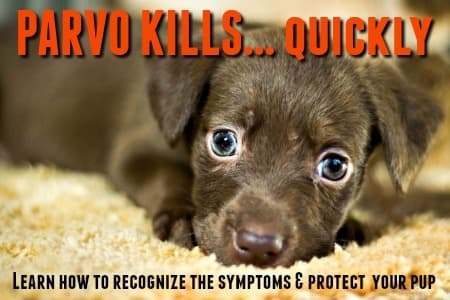 To give your big puppy, or dog, the best possible chance at living a long, happy, healthy life it's important to know what warning signs to look out for and how to protect him physically. You can get the answers and info. you need by checking out my page that takes a detailed look at the health problems of large and giant breeds. If you're the proud owner of a big pup/dog (or are about to be), I strongly recommend that you take out some pet health insurance! Why? Because even the veterinary bills can be on the extra-large to giant end of the scale for owners of the big 'uns, simply because they need MORE of everything! Medications of all sorts, tests,surgeries or accidents are all likely to be much more expensive for a Great Dane than they are for a chihuahua. 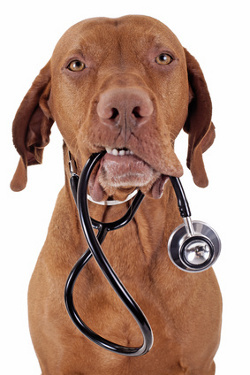 Get all the information and advice you need to get the best health plan for your puppy or dog on my Dog Health Insurance Guide page. If you don't want to empty your savings account in the event that your pup gets sick or hurt, this is a life-saver (in every sense of the word). Extra large breed dogs can make a wonderful addition to your life as long as you have done your research and are prepared for the unique challenges these gentle-giants can bring. They are stunning dogs, and make loving, loyal, faithful friends. I wouldn't be without my Rottweilers for the world - even (or maybe especially) when my 125lb male wants to cuddle on my lap! I hope the information on this page has helped you figure out whether or not a big dog is the right choice for you.